2013 Preaching Survey of the Year's Best Books for PreachersPreaching's Preacher's Guide to the Best Bible Reference for 2014 (New Testament General) Did the New Testament canon arise naturally from within the early Christian faith? Were the books written as Scripture, or did they become Scripture by a decision of the second-century church? Why did early Christians have a canon at all? These are the types of questions that led Michael J. Kruger to pick apart modern scholarship?s dominant view that the New Testament is a late creation of the church imposed on books originally written for another purpose. Calling into question this commonly held "extrinsic" view, Kruger here tackles the five most prevalent objections to the classic understanding of a quickly emerging, self-authenticating collection of authoritative scriptures. Already a noted author on the subject of the New Testament canon, Kruger addresses foundational and paradigmatic assumptions of the extrinsic model as he provides powerful rebuttals and further support for the classic, "intrinsic" view. This framework recognizes the canon as the product of internal forces evolving out of the historical essence of Christianity, not a development retroactively imposed by the church upon books written hundreds of years before. Unlike many books written on the emergence of the New Testament canon that ask "when?" or "how?" Kruger focuses this work on the "why? "—exposing weaknesses in the five major tenets of the extrinsic model as he goes. 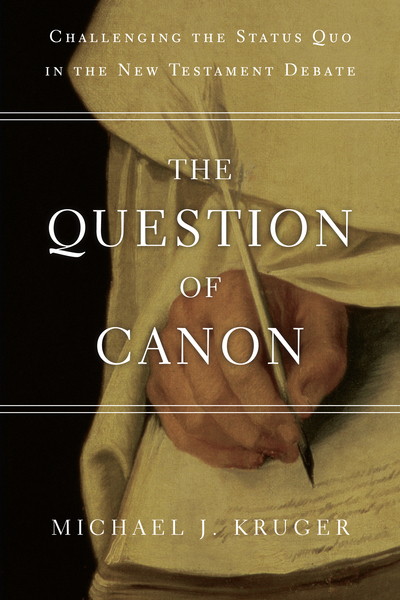 While The Question of Canon scrutinizes today?s popular scholastic view, it also offers an alternative concept to lay a better empirical foundation for biblical canon studies.